Nice title isn't it? I have to thank Niles for this, he brought it to my attention way before David Bowie used it as one of the 42 words to describe his current album. Anyway, it's all about the stuff under the surface, the Greek underworld, the dark and hidden depths. The sort of place in fact where horrible monsters lurk and foment into terrible creatures of pitiless cruelty. 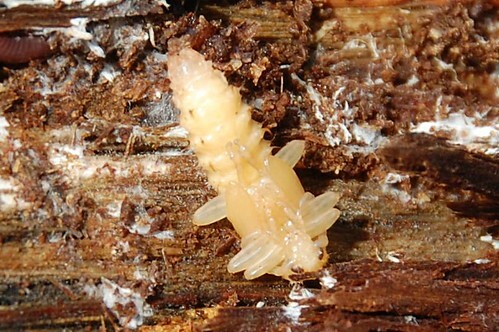 A bit like the beetle grub we discovered under the bark of a fallen oak tree last week. Anyway, I have to admit my abject failure to keep the bloglove going. No excuses. I didn't do it and I'm sorry. The things beneath the surface that are never truly revealed to the light of this blog just got in the way and I wasn't adequate to overcome them. And then, even worse, I started this entry at the beginning of May, set myself a task of revisiting all the links in one long list and ended up running away from the whole thing for two weeks. Read back through April and have another look at some of the blogs linked to, they are probably more worthwhile than mine.